King’s Vengeance, what a name to be stuck with just because you are second born. Not a title, with a name to go with it, like Sean, or Decan, or John… no King’s Vengeance. Aname you share with your uncle while he still lives, and since Atlanteans lives almost immortal I’m thinking it could get very confusing at family dinners. So, Conlan’s brother goes by Ven. He is the Kings’s sword, fighting for Atlantis, and Humanity. Fighting, not being diplomatic, that is brother’s, the High Prince’s job. He lead’s the Seven, those warriors closest to the prince. Erin is a witch, a witch with Wilding magic, and thirst for vengeance for those that killed her family. How fitting they end up together looking a Ruby that can save the soon to be Queen and her baby. With that Wilding Magic came the gift of Stone Singing, and while Erin can pull on the stones on Atlantis, they are not enough to save them, but the Goddess of the Nereids that takes up residence in her soul knows where to find it – the lair of the most powerful vampire on the west coast. Can they keep their passions at bay as they look for the Nereid Ruby? Can Ven live with a woman that is two woman? Can Erin get control of her Wilding Magic long enough to learn how to sing for ruby? and then how to use it? 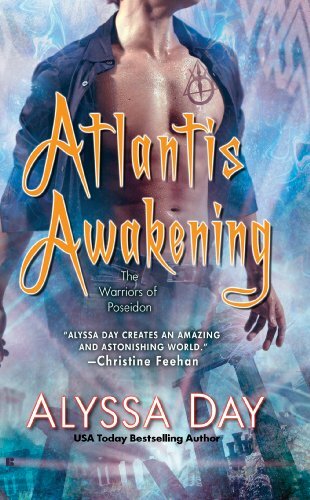 Come a swim with the Warriors of Poseidon, the water is fine and they will save you if it isn’t. Another delightful five star read.